It’s hard to make that decision without knowing all your options, so over the coming weeks we are going to reveal playable warlords as we kick off Warlord Legends, a series of blog posts focusing on specific playable warlords, showcasing their unique personality, story so far, and what that means for gameplay (we’ll also go into more detail on the three playable warlords we’ve already revealed). For those unfamiliar with the setting, we’re also going to use archetypes to explain exactly who’s who and why you would want to play as them (in the case of Sun Jian, he is the Daredevil, as detailed below). These are names defined by gameplay mechanics and aren’t taken directly from the history books, but they should help you figure out which character/s best suit you. First up is Sun Jian, the Daredevil. Sun Jian was born in 155CE to a poor family in the south of China. Unlike other warlords of the period who came from powerful, esteemed lineages, Sun Jian’s father was just a merchant, and this lowborn background is what gives him the constant urge to prove himself against stronger foes. He’s a skilled and daring warrior known for taking risks. He excels under pressure and is at his best when the deck is stacked against him. 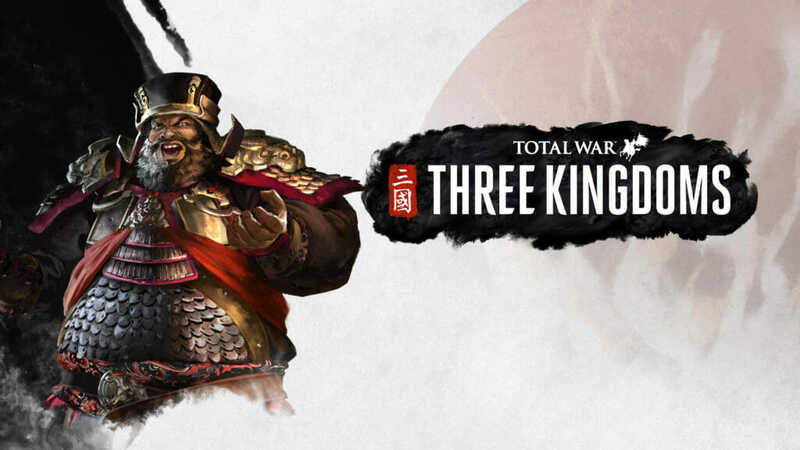 Fighting to end the chaos flooding through China, Sun Jian has risked his life for the good of the realm on multiple occasions. Most famously, when fighting bandits at the Siege of Wancheng Sun Jian placed himself at the head of his army and climbed the city walls alone, killing 20 men before the rest of his army flooded in. 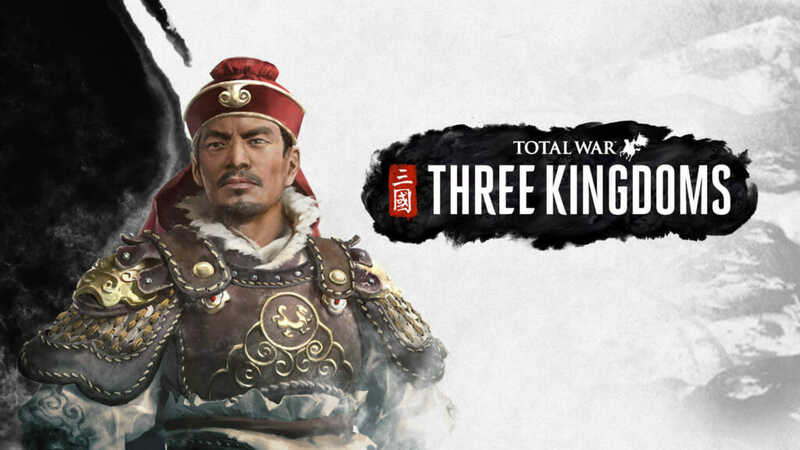 Sun Jian has never shied away from opportunity – and despite his loyalties, the fall of the imperial court presents great opportunities. 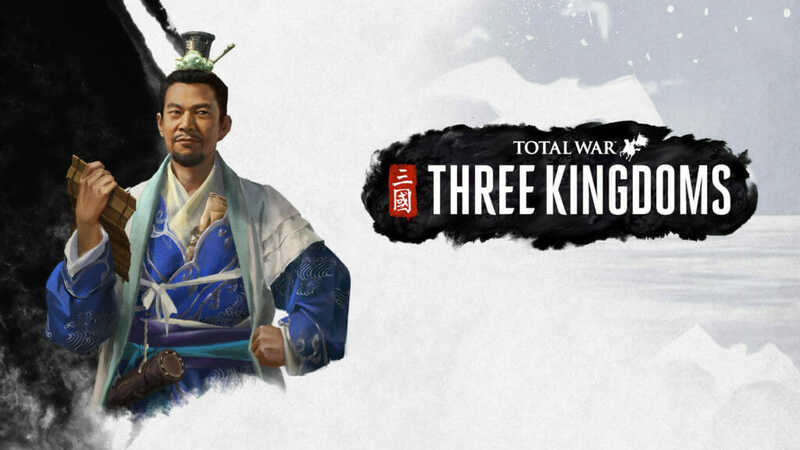 As a young man, Sun Jian rose from the obscurity of his mercantile upbringing, learning from the deeds of his father that fortune must be seized – never expected. It is this determined spirit that drives the Tiger of Jiangdong forward – may his roar sweep all obstacles away! Just prior to the start of the game, Sun Jian finds the Imperial Seal in the wreckage of Luoyang. Passed from dynasty to dynasty, it is said that whoever holds the Imperial Seal shall rule all of China. With the against the tyrant Dong Zhuo falling apart, Sun Jian decides to take the Imperial Seal back southwards to his home in Changsha, where his beloved wife and young family reside. Sun Jian is a talented warrior who pushes his armies forward and is always on the attack. If he keeps proving his bravery, he gains increased replenishment in enemy territory, recruits mercenaries at a lower price, and increases the satisfaction of characters loyal to him. In enemy territory, all his units also have guerrilla deployment, supporting his aggressive playstyle. 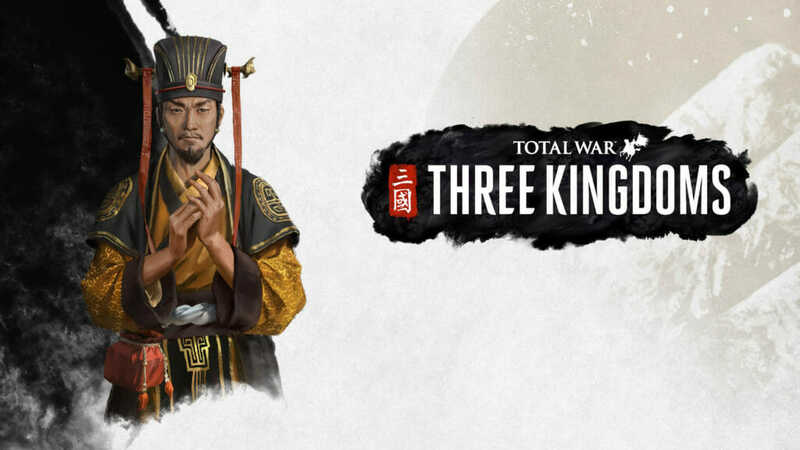 To finance his offensive campaigns, Sun Jian can leverage the connections from his merchant family background: all his ports increase income from commerce across his holdings. 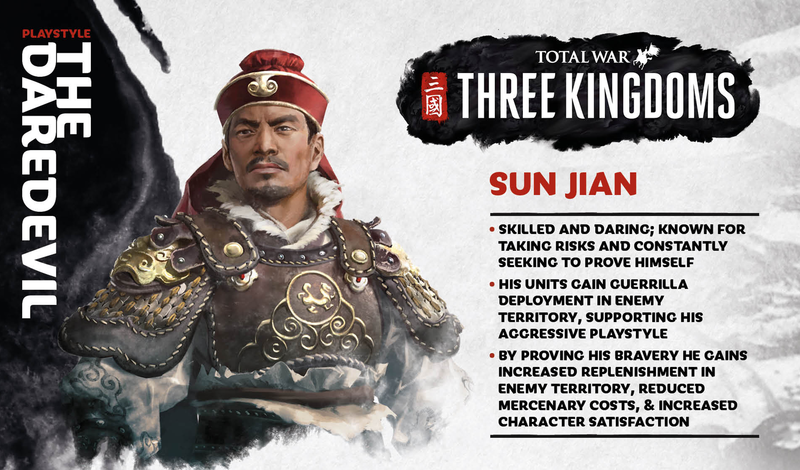 Playing as Sun Jian, you’ll be rewarded for initiating battles, particularly those where the numbers are against you. After all, even when outnumbered, a player who attacks multiple armies can still defeat the opposition through smart or aggressive tactics in battle. As Sun Jian’s entire army gains guerrilla deployment in such a situation, this means he has the shortest potential time to engagement of any faction, making it possible to defeat an army before reinforcements enter the fray. This is a potentially risky approach however, as without decisive action early on a player can find themselves overwhelmed in a protracted fight. Such battles are likely to be costly, but the replenishment bonuses granted to Sun Jian’s faction through resource pool effects grant his army reduced downtime between battles, and therefore the ability to continue fighting at the front as long as they are well-supplied. Sun Jian is married to Lady Wu, and together they have three young children: Sun Ce, Sun Quan, and Sun Ren. Guided well, their power and influence will only grow over time, perhaps even to eclipse that of the father himself! With a young family in the homestead down south, and the motivations of his so-called allies becoming murkier by the day, it’s easy to understand why Sun Jian wanted to return home during such a pivotal point in his story. However, on his way home he was ambushed by Liu Biao’s forces and barely managed to survive, losing half his army in the process. Although he would later win multiple battles against Liu Biao outside his city of Xiangyang, his risk-taking nature soon shone through, refusing to flee after omens told of his impending defeat. Soon afterwards he was ambushed again and shot to death with countless arrows, leaving his young children to grow up without a father. When playing as Sun Jian, your initial challenge is to make it back safely to your family and rewrite history in your favour. Early on in your campaign, each playable Warlord will have an initial dilemma they are faced with once they fulfil certain prerequisite actions. These dilemmas will put the player at a fork in the road at a pivotal moment in that Warlord’s story. One of the options available to you is the historical choice, reflecting what actually happened and the outcomes will follow how the events of the period unfolded. The other lets you forge a story down the path of what could have been. Total War is all about giving players the freedom to create their own stories at the fulcrum of some of the most exciting moments in human history, and these initial dilemmas epitomise that spirit. The first major opportunity for that to happen while playing as Sun Jian revolves around the much-coveted Imperial Seal in an incident where Liu Biao requests the Imperial Seal from you. You can accept his request, losing the seal and improving your relations with him. Or you can decline, pushing your alignment more towards Yuan Shu, making him an ally and Liu Biao an enemy. The fallout from this choice is huge and at this point your narrative can switch drastically. Either Liu Biao is appeased, your northern borders are relatively safe, and your immediate focus now changes to establishing your power base south of the Yangtze. Or it is all out war against Liu Biao and his vassals right on your doorstep. Either choice is likely to dominate your mid game. Your ultimate aim is to build a larger realm in the south/centre of China, forming the Kingdom of Wu, and then pushing forth even further to unite all of China under your rule. The allies and enemies you make during your while tackling your initial dilemma will have a key role in shaping how you fare in pursuit of that goal. Sun Jian is the choice of the risk-taker, the thrill-seeker. Someone who tires of playing it safe and knows that when the odds are stacked against them, it makes for a more epic tale of victory.